Oceanside Adventures hosts Los Angeles Based Travel Writer to See the Blue Whales and Dolphin off the Coast. Read the trip report. 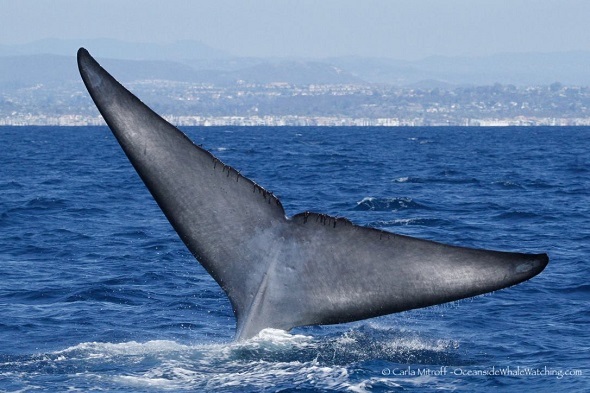 Blue Whales off Oceanside not a “Fluke”. The great gray-blue whale rose in the waves before us like an erupting volcano, seemingly pausing in mid-air before crashing back into the cobalt-blue water and disappearing. Like others on the boat, I gasped in surprise. A blue whale, the earth's largest creature, had just allowed us to have a small window into its world. We were sailing aboard the Oceanside Adventure, a new boat that offers whale watching trips out of Oceanside Harbor, when the whale appeared a few hundred yards off our bow. Blue whales are an endangered species -- only about 15,000 are estimated to be alive today-- and we'd been lucky enough to catch sight of one. The massive creatures, which often stretch the length of a basketball court and weigh as much as eight airplanes, are drawn to the Southern California coast to eat a small shrimp-like creature called krill. The whale was the biggest marine visitor we had that day as we bounded along the coastline, but it was far from being the only one. A group of dolphins said hello, skipping across the waves in front of the bow of our 50-foot catamaran. We leaned over the rails and cheered as they dashed ahead of us. A group of sea lions also barked a greeting as we passed their slippery resting spot, a buoy bouncing in the waves near the mouth of the harbor. Kids on board barked back. In addition, we spotted cormorants, pelicans and other ocean birds during our two-hour marine safari. The boat, which allows 360-degree unobstructed viewing, made it easy to spot whales and birds and other sea-going creatures. It was comfortable, too, with both covered and uncovered seating on a single level, which meant no one needed to bob and weave up and down stairways while we were underway. The Oceanside Adventures boat, which began sailing daily in July, can accommodate up to 49 passengers on cruises that depart from Oceanside Harbor. It will offer the trips year-around. The company is affiliated with Dana Wharf Sportfishing and Whale Watching, which pioneered whale watching in Southern California in 1958. Among the passengers on board with me that day was the Chris Hanley family from Arvada, Col., who were taking their second trip on the boat. They'd loved the excursion that they'd taken a few days earlier, and decided to come back, "We saw 40 to 50 adult dolphins and babies on our first trip," said Chris. "We have to go home tomorrow, but we had so much fun the last time, we wanted to come again." Diane Dahl Cullins is another enthusiastic, frequent passenger. Cullins is so passionate about whales and dolphins that she joined the American Cetacean Society, where she is now president of the San Diego Chapter. She praises Oceanside Adventure's boat, crew and excursions. “The boat is brand new, has a very smooth ride and the captain is a very well-informed naturalist. The trips are a lot of fun," she said. For further information, call 888-507-1130 or see OceansideWhaleWatching.com, where information and a daily log of marine sightings can be found. Oceanside Harbor is accessible from the Harbor Drive exit of I-5 at 315 Harbor Dr. South. Introductory fares are: $39 adult, $34 Military/Senior (55+) and $29, children up to 12. Rosemary McClure is a Los Angeles-based travel writer.